Many businesses have remote employees or multiple offices spread worldwide. The task of communicating effectively across the multiple locations is a challenge. Emails or newsletters are lost or ignored and they are not secure, so internal communications run the risk of getting beyond the office walls. Most companies avoid publishing sensitive information or information that is not relevant to all employees. Multiple location digital signage has unshackled the way corporations communicate and brought back the individualized employee communications lacking in today’s global economy. In simple terms, the cloud has changed the business world. Business’s internal communications can happen face-to-face even if they aren’t in the same room or on same continent. Essentially removing the roadblocks imposed by traditional employee and office communications. Remote employees and offices no longer have to feel left out in the cold and isolated from the daily corporate happenings or the corporate vision and mission. Multiple location digital signage can be managed through the cloud and it doesn’t have to be complicated. Taking the road of other cloud based business communications, digital signage can be created, edited and managed from anywhere by logging into an online subscription. 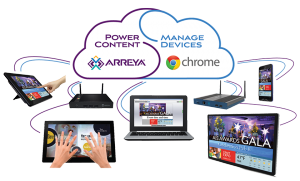 Many software programs have adopted the Software as a Service (SaaS) platform, including Arreya Digital Signage Suite. There are many levels of SaaS programs, some require users to download the software to a designated computer and pay a licensing fee per device and require you to pay for updates. Digital signage (SaaS) programs are no different. Many require licensing fees, proprietary hardware and fees for updates, special features, design and storage. True Cloud based SaaS – The software resides on the cloud so there are no software to download. This allows for online access from any computer. Multi-level Management – Allows for specified individuals to have access to specific parts of the content for individualized messages while restricting changes to other content or full access for administration. Allowing auto updates from Google sheets or other data sources adds an extra level of content security. Flexible Hardware Choices – Pick the hardware that best fits each of the locations depending on need and reliability. Interactive touchscreens, kiosks or video wall options. Easy to Use – Content needs to be easy to update so your content is always fresh and relevant. Real Time Viewing – No preview mode. Corporate communications is only good if it gets in front of the employees. 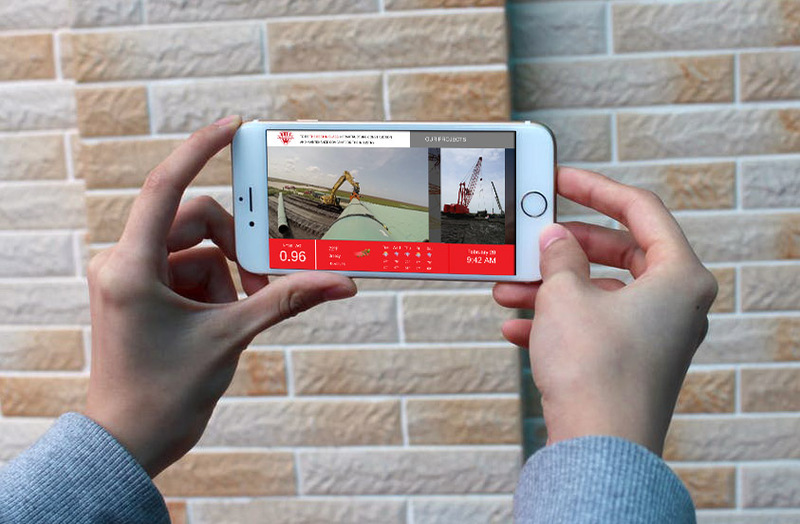 Real Time viewing allows for real time content viewing also known as WYSIWYG – what you see is what you get. Kiosk Mode – Locking devices into kiosk mode makes sure your content is the only thing on the monitors. No unwanted URL access on devices. Traditional corporate communications limit the distribution of information and do nothing for spreading the corporate values and brand. Paper communications are outdated instantly and at risk for getting outside corporate walls. Printed information is limited to general information, just like emails. Digital signage makes it easy to have consistent communications across large corporations and is secure. Content can be designed with the corporate branding, mission and vision of the company. Insuring all offices, no matter how remote, are part of the corporate message. Content that normally couldn’t be distributed, such as employee birthdays, wins or specific office communications, can be distributed through digital signage. Content can be divided into different information for different departments. Call centers can show call statistics or wins. Individual departments or offices can celebrate an employee’s birthday or welcome a guest. Weather alerts can be issued for employees that work outside or on the road, giving them advance notice so schedules for deliveries or outdoor work can be alerted. With Arreya, you can create a hierarchy of channels to categorize information. Complete corporate communications for all employees in all departments. Digital signage channels can be outward facing in lobbies with wayfinding, corporate marketing messages and videos, stock tickers, RSS news feeds and of course social media. Interactive touchscreens are another employee. Publish training videos to your digital signage. Employees can login and watch necessary training videos from anywhere, saving time and money used in personal training and employees traveling to a specific office for training. With the built in analytics, in Arreya, you can track which employees logged in, how long they watched and what they watched. Videos are easily updated as they become outdated. Installations that would normally take two employees, one for training, now only take one; the training videos are the second employee. Interactive monitors in the lobby or a public kiosk can be a source of corporate mission and vision for visitors. Publish key employee biographies, allowing visitors a glimpse at your corporate foundation. 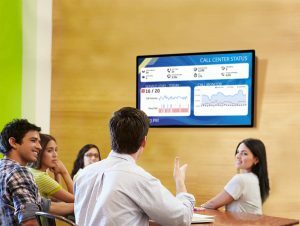 Corporate history timelines and videos can become part of digital signage and easily updated as key moments happen in the future. A corporate overview along with different office locations throughout the globe can become a part of every location. A clear, consistent message for all. Lobby kiosks can accommodate employment applications and can be added and reviewed by the human resource department to any location without travel. Streamlining the employment process for the entire corporation. Wayfinding can be a necessary tool in large public buildings and offices where receptionists are usually the source of directions. Valuable work time is wasted on giving visitors directions on costly printed maps. 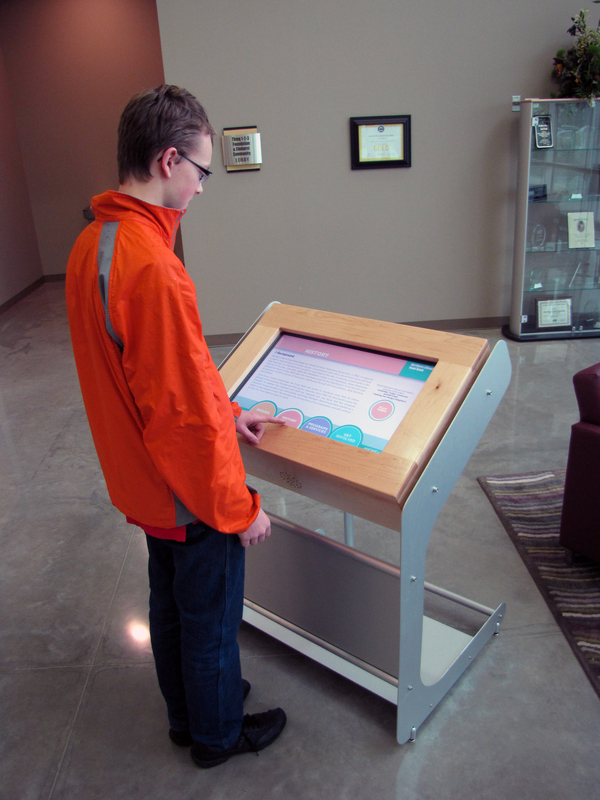 Interactive wayfinding allows visitors to find exactly where they need to go. In hospitals, wayfinding is one of the key components to making the stressful patient, visitor experience tolerable. Interactive wayfinding can be broken into different floors, department lists, or individuals all giving precise directions. Add GIF videos to show directions along a floor map. Employee benefit packages and corporate employee handbooks can be added to your internal digital signage and shared through a secure login. No more costly printed employee handbooks, that are outdated or thrown into a drawer instantly. Digital signage gives all employees access to the corporate information wherever they are located. Updates can be handled by the human resource department and with Arreya, deployed instantly to all devices, including phones and tablets. Software is only part of the equation to multiple location digital signage. Powerful, reliable devices that work seamlessly with the SaaS are critical to insure your corporate message is seen. Many digital signage services have proprietary hardware that is costly, but also requires manual updates to coincide with the software updates. Because the hardware is a connection between the software and the monitors it must be compatible with both, which doesn’t always happen. Hardware updates can shut down monitors or block content information from being released to the monitors. Many digital signage softwares show content in preview mode, so even though you see your content in the editor, you don’t know what is being shown on the monitor. In the end your digital signage content is not seen and your message is lost. 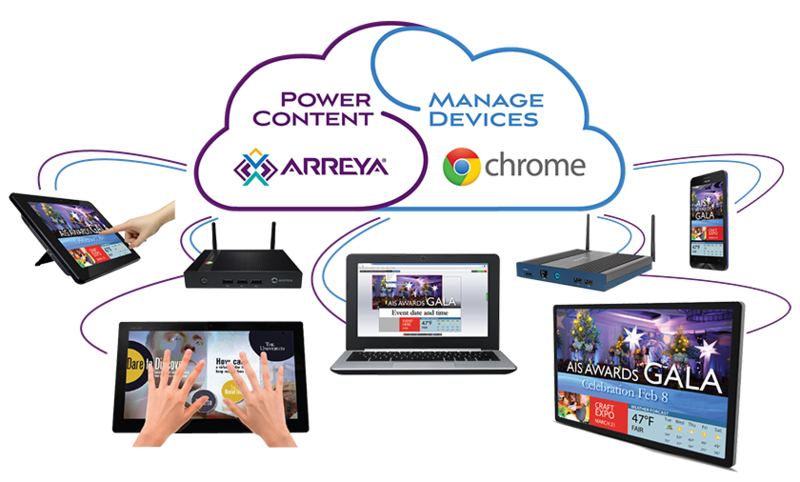 Google Chrome devices along with Arreya is the most reliable and powerful platform on the digital signage market. The devices and service work seamlessly together. Updates to Google Chrome devices, like Chromebox, Chromebit and Chromebase are automatic and rolling just like the Arreya software. No extra fees for updates and with Chrome Enterprise Management, all devices can be managed remotely. The health of your devices is at your fingertips through the online Management System. Know which devices are working and if there are any issues. The big key to a successful multiple office digital signage deployment is using hardware that isn’t a wall between the software and the monitor. Hardware should make the experience better without interfering with the transfer of content. Google Chrome devices lock into Kiosk Mode insuring your content is the only thing on the monitor. Even if the monitor loses connection, your content automatically restarts when the connection is fixed. 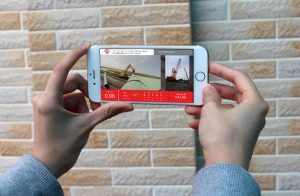 Arreya was developed in the latest technology with a free transfer of information from the editor to the monitor with real time viewing or a WYSIWYG platform. There is no need for proprietary hardware and Arreya is hardware agnostic and tested on many devices but recommends specific hardware for it’s reliability and commercial use. All digital signage needs a good internet connection to handle content effectively. High speed internet makes videos play consistently and loads content quickly. Even though content is cached on the Google device, internet speed is critical. Digital signage can make corporate communications easier if done correctly. It can increase employee engagement and happiness which increases employee productivity. The right digital signage system can save money and increase the bottom line for multiple location businesses. The ripple effect can be felt throughout the corporation including the human resource department, by decreasing turnover due to employee happiness. Multiple office digital signage makes corporate life easier.